The link between astronomy and music is not a common one and people who share a love for both can point to few classical music compositions with direct references to astronomy. A couple of pieces come to mind having celestial connotations – Wolfgang Amadeus Mozart’s “Jupiter” symphony (No. 41, in C Major) and Joseph Haydn’s “Mercury” symphony (No. 43, in E-flat Major). But these names are fanciful additions by others, unrelated to their composer’s musical conceptions. There are a few other fringe pieces having derivative themes relating to the cosmos – Ludwig van Beethoven’s Sonata No. 14 in C-sharp Minor and Claude Debussy in “Claire de Lune”, both “Moonlight” masterpieces. And then there are the six string quartets comprising Haydn’s Opus 20, known as the “Sun” quartets, and Haydn’s comic opera Il Mondo della Luna (“The World on the Moon”). 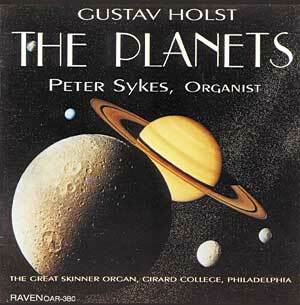 The most familiar music conceived on an arguably astronomical subject is The Planets, an orchestral set of seven pieces by British composer Gustav Holst (1874-1934). Written between 1914 and 1917, usually during weekends and holidays scattered between Holst’s day job as a music teacher, The Planets is by far his best-known work. Still, The Planets was not musical inspiration derived from the night sky. Holst’s eyesight was very poor and he obviously was not a keen observer. Later though, Holst read a popular astronomy text of the time and realized with excitement that the ideas which were put forward in scientific terms were exactly the same as those which he had been trying to express in music. What a wonderful tautology. If anyone would like to add to my short list here, I’d be anxious to listen to some additional pieces that tie the heavens to musical acuity.